Which AC electric car conversion kit? I want an AC electric car conversion. I am planning on converting a RWD car, possibly mid-engine, and was having difficulty finding the best system. I have to drive about 60 miles per day for work, most of which is spent on the freeway at 70 mph. If there is not a kit already that would be strong enough for my needs, I would not be opposed to having someone else perform the install for me. Just to let you know I may be able to charge the car while I am at work, and I am also planning on installing flexible solar paneling into the roof. I would most likely plan on using Optima yellowtop batteries, but how many would depend on the motor requirements. They come in "small" and "large", and you can get them at Electro Automotive or Metric Mind. Update:...or HPEVS. First, have a look at the articles on the right - "recommended reading". It's an interview in three parts with a gentleman who did the smartest AC electric car conversion I've seen yet, a VW Passat. 320 volts, motor out of a Ford Ranger EV. Stay in touch - can't wait to see your conversion! Join in and write your own page! It's easy to do. How? Simply click here to return to Motor Q&A. What is the best way to start my first electric conversion? I've got a compact pickup. I read about DC Motors, then AC motors AC single phase and AC 3 phase. I would like to evolve into the best EV instead of risking tons of money on the best state of the art equipment from the start. What I am asking is: What is the best bang for the buck for a beginner? Here's what you do: Take your Chevy S-10, get one of Canadian Electric Vehicles' S-10 conversion kits, and set them next to each other in the garage overnight. In the morning, your truck will have converted itself! It just doesn't get any easier than that. But it's solid value for your money, and Randy (at Canev) is very helpful. Shortly you'll be the happy driver of a very good, reasonably priced electric pickup. Read my article about conversion kits for beginners next! This Hyundai Accent makes a good electric car conversion! 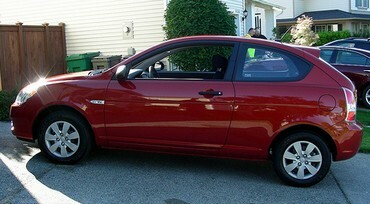 What kind of EV motor and conversion kit would you suggest for a 2001 Hyundai Accent? That car looks pretty light. The kit everybody's talking about these days is the AC-50 and Curtis 1238 controller combo that you get from HPEVS. Seems like it would do a good job in your car, too. Ask any conversion kit seller on this conversion kit page list, and they'll also help you choose the right kit. P.S. Don't forget to pick up a conversion manual before you start your project.